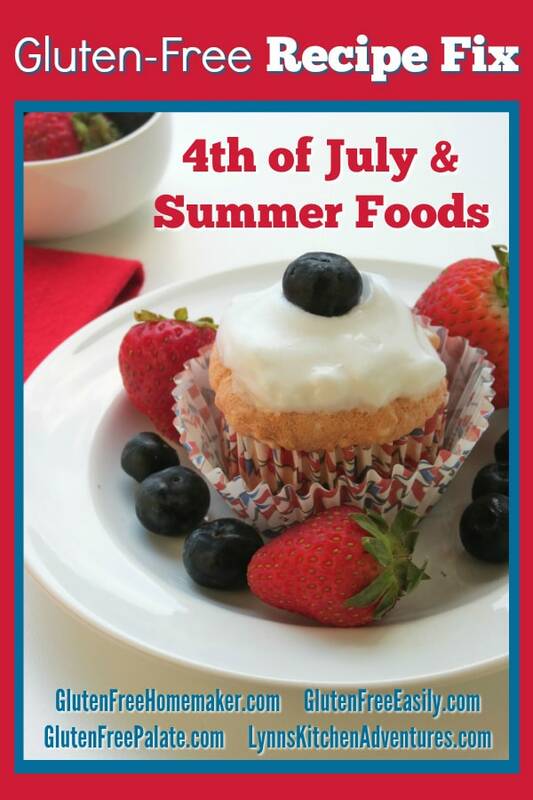 It’s time for the 4th of July and Summer Recipes edition of the Gluten-Free Recipe Fix carnival. One of the joys of summer is definitely the food. Fresh fruits and vegetables that we can eat right off the vine—and rejoice when we do!—and all the recipes we can make from those fresh fruits or vegetables—like crisp salads, irresistible cobblers, luscious homemade ice cream, and chilled tasty beverages. Plus, there are all the great grilled recipes that tend to happen! And I’m a big fan of the creativity that goes into patriotic recipes for 4th of July, especially when nature offers the red, white, and/or blue coloring. 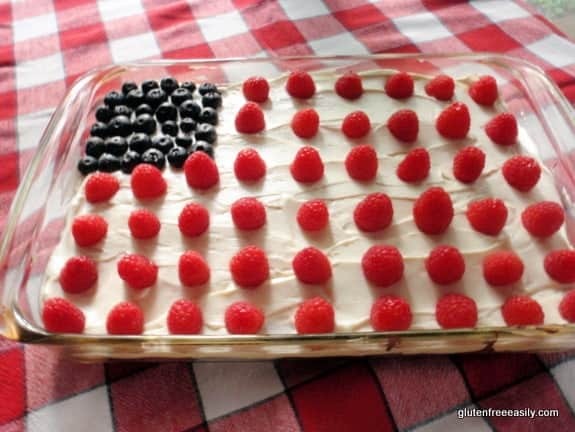 Bring on the gluten-free 4th of July and summer recipes! Recipes must fit the current theme. This event will be open through Wednesday, July 13, so if you’re a blogger please link up your best patriotic and summer recipes each week. All of us will want to check back here every few days to see the latest! This week I’m sharing a few of my very favorite 4th of July and summer recipes: Flourless Chocolate Quinoa Cake, Cucumber Chickpea Bruschetta, and Crustless Peach Pie. Flourless Chocolate Quinoa Cake ~ This flourless cake is doing its patriotic best and the “inside” tastes just as good as the outside looks! 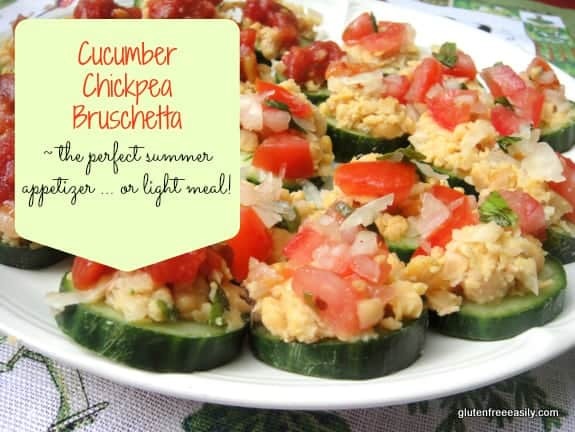 Cucumber Chickpea “Bruschetta” ~ You have to try these appetizers to see how good they really are! These are a tasty grain-free and vegan option. 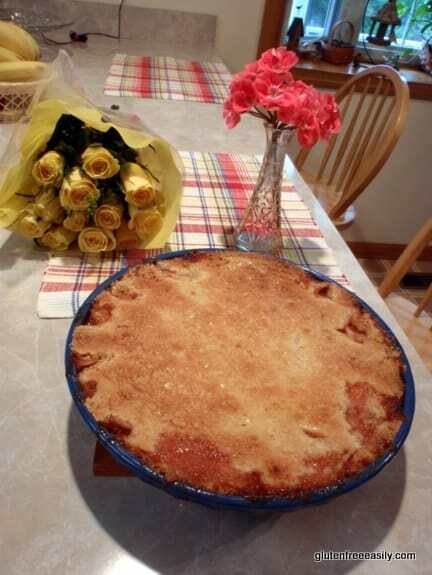 Easy Crustless Peach Pie ~ This crustless pie is such an easy and delicious way to use those juicy sweet peaches. Entries should fit within theme of the carnival (4th of July and Summer Recipes). While all of the links in this carnival should contain gluten-free ingredients, please verify that for yourself. In particular, people have differing opinions on what brands they consider safe. Please keep this guidance in mind as you view the recipes. Such a festive bounty linked up!! I am really going to enjoy looking at all these recipes! Thanks for this gluten-free recipe fix! Hi Aimee–Welcome to gfe! 🙂 Yes, there are always terrific recipes shared for Gluten-Free Recipe Fix. Have fun!